Announcing our Interim Rector The vestry is pleased to announce the successful call of our Interim Rector, the Reverend Mr. Steve Rorke, effective January 1, 2019. Steve received his divinity degree in 1975 and retired in 2011 from a nonprofit company. He has been serving as interim rector, supply clergy, and more in our diocese since then. He will be working about half-time for us; though he will likely serve longer some weeks than others. He will be in the church office on Tuesdays, Wednesdays, and Thursdays. 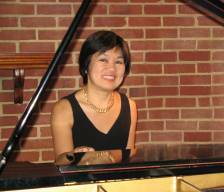 Mariko Hiller has been Organist/Choir Director of St. Patrick's since 1998. Mrs. Hiller studied organ, piano and music education in University of Arizona and George Mason University. She is a founder of the Odeon Chamber Music Series (www.odeonchambermusicseries.org) and a co-founder of the combined choir series since 2000.